Vortex introduced two new scopes in the Diamondback series. This wouldn’t overall be a big deal to brag about, but there’s something quite exciting about these two scopes. 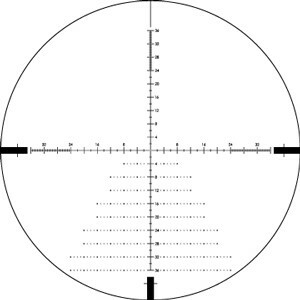 They have the reticle on the first focal plane which for most shooters instantly means they are expensive. Probably somewhere in the 4-digit range expensive. Not these two. Their MSRP for both scopes is below $500 and the street price is expected to be even lower. Fortunately – Not in this case! Click for more information on Amazon! You are getting a great scope if you pick up one of the Vortex Diamondback Tactical FFP’s. The first scope in the family is the 4-16×44. The second scope is the 6-24×50. Both scopes are predestined for long-distance shots, and the first frontal plane reticle is perfect for this use. Having the reticle on the first frontal plane results in a proportional change of the reticle when the magnification changes. This is tremendously helpful for long-range shots as windage, elevation, holdovers, etc. all stay consistent across the magnification changes. Both scopes come with Vortex’ EBR-2C reticle. It comes in either MOA or MRAD and is a fantastic reticle to hold windage and elevation adjustments when you engage multiple targets rapidly. It’s genuinely a reticle that allows for quick target acquisition. Vortex initially introduced this reticle in the Razor HD Gen II riflescope series. Both new scopes offer a 30 mm tube. This is what you’d expect from scopes for long distance shots. 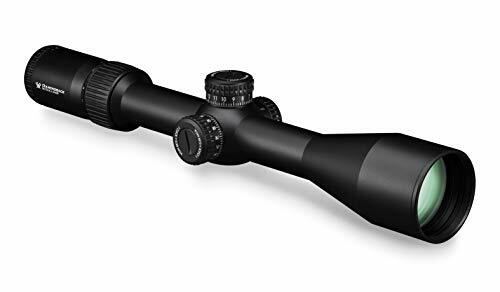 This large diameter ensures that you have enough adjustment range for both windage and elevation and that you’ll get enough light into the scope to get a great image. As you would expect, the lenses are multicoated and anti-reflective. They provide a crisp and clear image even in low light conditions. The reticles are etched into the glass. The scopes are entirely fog proof and waterproof with the tubes being nitrogen purged to prevent any moisturization on the inside. The tube is constructed from aircraft grade aluminum. Being long-range scopes, they are also built shockproof to keep stable under heavy recoil. The turrets are exposed and allow quick and precise adjustments for windage and elevation. They offer a zero-reset feature, so you can set them to zero after you sighted the scope.